Susan Glaspell’s three-act play, Inheritors, has been revived recently for good reason. Written in 1921, in the aftermath of World War I and the Alien and Sedition acts, it tells the story of three generations of Americans and the erosion of fundamental American rights, particularly free speech, in a time of overt nationalism. The play opens in 1879 with Grandmother Morton’s stories of her pioneering migration west and the taking of rich Mississippi valley land from the Indians, resulting in the Blackhawk war of 1832. Her son, Silas Morton, an uneducated yet visionary farmer, dedicates a piece of the land to create a “college in the cornfields” in a tribute both to Blackhawk and Silas’s beloved friend, a Hungarian revolutionary and immigrant named Felix Fejevary. In the second and third acts, the play moves to the “present” – 1920 – and charts a conflict between the son of Felix Fejevary, now a wealthy banker and trustee of Morton College, and Silas Morton’s granddaughter (as well as Felix’s niece), Madeline, a student there. Attempting to gain state appropriations for the college, Felix finds that political protestors among the students, as well as an outspoken professor, must be stifled in order to conform to the “Americanness” demanded by the state. Coming into her true inheritance from her idealistic grandfather, as well as her inheritance as an American, Madeline sacrifices her privileged social position to defend the rights of Hindu students who have been arrested for protesting British oppression of India, as well as those of a conscientious objector who remains imprisoned in a solitary 3 x 6-foot cell, even though the war is over. Inheritors expresses Glaspell’s lifelong concern with social justice and the delicate balance between law and rights that is fundamental to American democracy. The play evokes questions about what it means to be an American, raising issues central to American identity: individuality, conformity, immigration, racism, and nationalism. In addition, it is a classic coming-of-age story in which a young woman defies her family and her gender to stand up for what she believes in, committing herself to a moral act that will define her adulthood. 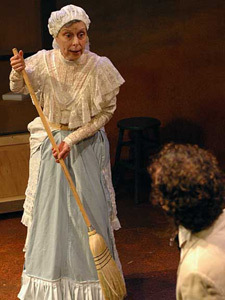 This entry was posted in Inheritors, Performances on May 17, 2008 by Martha Carpentier. 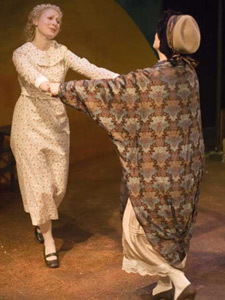 The Metropolitan Playhouse, a New York resident theater dedicated to exploring and re-vitalizing American literature and culture, staged a landmark production of Susan Glaspell’s Inheritors on November 11 – December 11 2005, as part of their 14th season devoted to the “Outsider.” SGS members provided post-show presentations on November 13, 2005 (Martha Carpentier, Sherry Engle, Sharon Friedman, and Monica Stufft) and on November 20 (J. Ellen Gainor). For more information about The Metropolitan Playhouse, 220A East Fourth St., New York, NY 10009: www.metropolitanplayhouse.org. Madeline and Ira Morton, played by David Fraioli. Photo by Michelle DeBlasi. This entry was posted in Inheritors, Performances on December 11, 2005 by Martha Carpentier.